Jim Puzinas, American. (1960 - ). Growing up in Boston, Jim Puzinas's exposure to art began early in life with visits to the Isabella Stewart Gardiner Museum and Boston's Museum of Fine Arts where he gained broad appreciation for the leading American Impressionists of the early 20th century. Living abroad for six months in Spain in the late 1970's, presented many opportunities to explore the paintings and techniques of the European masters at the Prado Museum in Madrid, from Baroque artist Velazquez to modern master Pablo Picasso. These early experiences influenced Jim's desire to always have art around him, first as a collector, and then as a painter and gallery owner. James Puzinas was born and educated in Boston, MA. He is primarily self-taught as an artist, but counts, in addition to his background in the arts, among his influence, the teachings and paintings of Cezanne, Charles Hawthorne, and more recently the contemporary plein-air artist and teacher Kevin MacPherson. Jim Puzinas is a member of the North River Arts Association in Massachusetts. His impressionist New England landscape scenes emphasize strong composition and proper color selection. 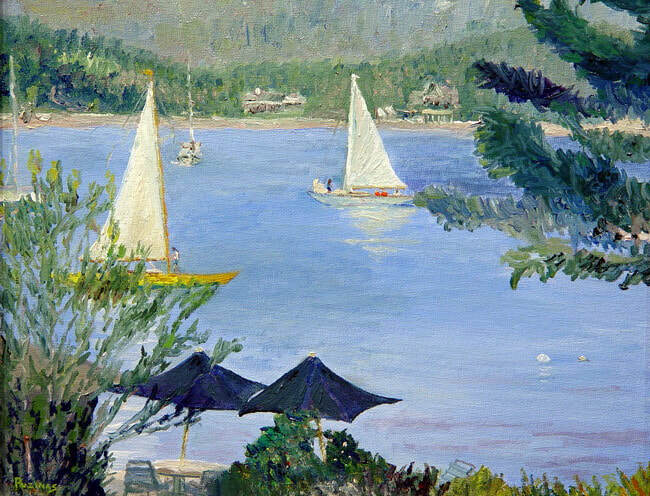 His paintings are noted for their bold colors with a strong use of light and reflection.